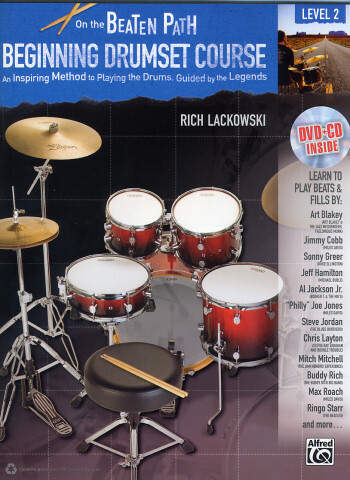 Tiger Bill Reviews On The Beaten Path: Beginning Drumset Course by Rich Lackowski Book CD DVD from Alfred Publishing. Product Update: Author Rich Lackowski has now added a DVD to this package. This review has been updated to reflect the new addition. What was so cool about that series was the way Rich not only introduced us to some of the most famous drummers of the past and present, but how he carefully broke down their most famous patterns into bite-size pieces and wrote them out step-by-step so that they were relatively easy to learn to play. Rich has produced another trio of books, each available with a CD and DVD, based on the same concept but this time he slants them specifically toward beginning drumset players. This is a very practical approach because to be the best drummer you can be, you need to be aware of what the best drummers in the business are playing. In this series, Rich covers that in detail. The first volume opens with some diagrams explaining the parts of a drumset and then covers how to set one up. Next, he explains and illustrates the correct method of holding the sticks using matched grip along with the technique of making a basic stroke. Following that is a page on basic foot technique and a few more pages explaining how to read music notation. The book concludes with diagrams showing the various parts of a drum, basic categories of drumheads and their use, drum tuning, and drumstick selection. In between that is the really good stuff! The first volume in the series is broken into two separate sections, Basic Rock Beats and Basic Rock Fills. Each section contains one or more patterns that a particular famous drummer is known for. Rich includes a little background info on the drummer along with the pattern, broken down into easily digestible steps that start easy and gradually build until you are playing the entire pattern. Rich also tells you the title of the song and the album that each original beat or fill was from. At the end of the first book you will have learned to play 26 authentic rock beats and fills from some of the world's best drummers. The second volume in the series briefly recaps what you need to know as far as reading music is concerned, and then covers Basic Blues and Shuffle Beats. Basic Blues and Shuffle Fills are next followed by Basic Jazz Beats and Basic Jazz Fills. When the smoke clears you will have learned to play over 50 legendary blues and jazz beats and fills from more of the greatest drummers on the planet. The third and final volume in the series covers country, funk, reggae, Latin styles, and jazz beats and fills. It also includes advanced time signatures, time and tempo manipulation. An audio CD is included with each book that contains all patterns in each of the books performed by Rich Lackowski. And the included DVD shows Rich himself demonstrating each of the tracks on the audio CD and it also includes visual explanations of all of the additional info that appears in the tools and terms areas throughout the book. As a drum instructor with lots of experience I know that keeping my students motivated is the most important part of my job. If gifted students quit due to boredom before reaching their full potential, that's not only a huge loss for the student but for the drum community as well. Rich's method of relating the basic drumset patterns to famous drummers of the past and present is definitely designed to help keep students motivated. If you're an instructor, you'll love using this series with your beginning and intermediate students. If you're a beginning or intermediate drummer trying to go it alone, you won't go wrong with any book in this series. I strongly advise you to get them all, regardless of your favorite musical style. The more you learn from all styles, the more original you can sound when you play your favorite style! And with the addition of the new DVD, whether you learn more effectively by listening or watching, Rich has got you covered! I highly recommend this series to both drumset instructors for their students and drummers attempting to learn on their own. And at a retail price of just $19.99 for the first book/CD/DVD, $24.99 for the second and $24.99 for the third, they're a real bargain. And you can find them at an even better price by clicking the Web links below.